These 28 recipes have been proven to work through Korean cooking classes for foreigners. Delicious dishes that are simple to make—with ingredients that are easy to find. Cooking is a snap when you set this freestanding English-language cookbook up in your kitchen. In past years, non-Koreans were unlikely to know anything about Korean cuisine outside of bulgogi and kimchi. Today, however, many gastronomes seek a wider variety of dishes, from various kinds of jjigae to the blend of vegetables in bibimbap. It turns out that Korean food boasts a number of advantages that coincide with global culinary trends: it is healthy, representing a balanced diet composed of rice, soup, and side dishes, with unique flavors created by fermented sauces. More and more people today are not just trying the food out of curiosity but rather making it themselves and enjoying it on a regular basis. American actress Gwyneth Paltrow uploaded a video of herself making bibimbap to a cooking website that she runs personally, citing it as her secret method to staying slim. Australian actor Hugh Jackman was shown making kimchi on Kimchi Chronicles, a program that appeared on American public television channel PBS. Even US First Lady Michelle Obama tweeted, ��Last week, we picked Napa cabbage in the garden. Now, we're using it to make kimchi in the kitchen. Make it at home.�� As these trends raise the prominence of Korean cuisine around the world, English-language cookbook A Korean Kitchen Companion has been published to make this delicious food easier for readers to enjoy—and make themselves. 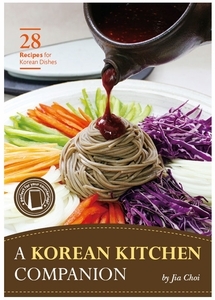 The cookbook was written by Dr. Jia Choi, an expert in Korean cuisine. It represents the sum of the knowledge she has acquired while running Korean cooking classes for non-Koreans, and is part of her effort to share that knowledge with readers from English-speaking countries. After asking herself how she could share Korean culture with visitors to Korea in the shortest amount of time, she became convinced that food was the answer. This led her to establish O��ngo Food Communications, a culinary consulting company, in 2008. In addition to her cooking classes, Dr. Choi also offers culinary tours to give tourists in Korea further insight into Korean dining culture. This is yet another way that she endeavors to share Korea��s culture through its food. For this book, Dr. Choi selected from her cooking classes 28 dishes that her foreign students have particularly enjoyed. In addition to the standard meat dishes (spicy stir-fried pork and braised chicken in soy sauce), and vegetarian options (kimchi, chilled white radish salad, and zucchini salad), it also features noodle options (noodles served with spicy squid, spicy noodle salad, and glass noodle salad), stone pot bibimbap, stews, and various other dishes. The author relied on the following three principles in selecting which recipes to include in the book. First, she wanted recipes that are easy to make. Second, she placed priority on ingredients that are readily found outside of Korea. Third—and most importantly—she selected dishes that taste great. While preparing the recipes, Dr. Choi took great pains to make them more accessible to her readers, who might otherwise find Korean cooking techniques confusing and complicated. She also throws in some handy tips. Readers are told that herbs or lemon chives can stand in for Korean garlic chives if the latter are hard to find, and that bulgogi, or marinated stir-fried beef, tastes great inside a sandwich. Yet another attractive aspect of the book is its freestanding design: it stands up just like a tabletop calendar! Set it up in the kitchen, and you can glance over the recipes as you cook. With the recipes and pictures on facing pages, it��s possible to take everything in with a single glance. Other helpful features are icons on the top of the page that indicate about how much time is needed to cook each dish and whether or not a given dish is suitable for vegetarians. Jia Choi developed a natural interest in food culture when she encountered the cultures of Brazil, Japan, and parts of Africa as a child. She began the work she is doing today out of the belief that the best way to share her values and knowledge about Korea with the world is through food. Since 2008, Choi has been the president of O��ngo Food Communications in Seoul. In her work there, she uses her own experience living overseas to bring Korean food to people around the world in a way that suits their sensibilities. The company��s name, O��ngo, means ��revitalizing tradition through modernization.�� Reflecting this mission, Choi is engaged in researching and disseminating the ways in which traditional Korean food can become quicker, easier, and more delicious to prepare and eat. Choi is an expert in Korean cuisine with a PhD in food and nutrition from Ewha Womans University. She runs a Korean cooking class and food tours.